…exists to preserve and promote access to climbing areas, and to conserve climbing resources in the New River Gorge and surrounding areas. In the early 1980s, you could count the number of climbers who even knew about the New River Gorge on your fingers and toes. Today, it’s an international destination and world-class climbing area with thousands of traditional and sport climbs, and a rapidly expanding selection of equally world-class bouldering areas. Ask almost any climber in America if they’ve heard of “the New,” and odds are they’ll say, “Of course!” Many of them will have climbed here before and almost all of them will at least know somebody who has. The sandstone here is unlike anyplace else in the country. It’s bullet hard and seems almost tailor made for a variety of technical, gymnastic and thought-provoking rock climbing. Led by guys like Rico Thompson, those 20-odd climbers from 30-odd years ago recognized the potential the region had to attract attention, so they began to think of ways to make it positive in nature. 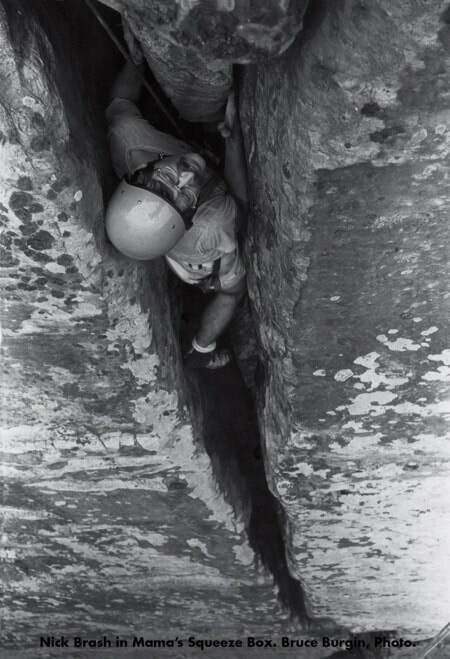 In the early days, they organized for garbage clean ups, and such projects laid the ground work for a productive and positive relationship between rock climbers and the National Park Service. Eventually, Thompson left to work with the Access Fund, a fledgling climbers’ advocacy organization that has since become a world leader in conserving natural resources AND climbing access. However, Rico left behind a legacy of service and cooperation that thrives in the New River Gorge still. In the mid 1990s the focus of climber-organized service projects shifted to trail building and physical access. Soon enough, the Park began work on a sweeping climbing management plan. Recognizing that having a unified voice in CMP discussions was vital to climber interests, locals and climbers from surrounding metro areas banded together to form a non-profit, the New River Alliance of Climbers. Thanks to NRAC, climbers at the New today enjoy the fruit of an almost unprecedented productive relationship with Park management, the U.S. Army Corps of Engineers and private land owners. We have a standing permit to repair and replace old fixed anchors as we see fit, and to date, we have replaced thousands of those. Climbing advocacy in America has evolved from a reactionary model toward one that is more proactive in terms of securing access for climbers in the long term. As that landscape changes, so will NRAC. Now that the re-bolting effort has years of momentum, we will also work to ensure that our history of mostly unfettered access to area crags is also our future. If you’d like to speak with a real live person about the history, present and future of the New River Alliance of Climbers or about climbing in the New River Gorge region in general, please feel free to contact any of the following people.